The 34th match of the IPL 2019 will be played on 18 April at 8 PM IST between the Delhi Capitals and the Mumbai Indians at the Feroz Shah Kotla, Delhi. Both DC and MI have won five matches and lost three matches each so far in the tournament. DC are placed the at second position, one position above MI, on the IPL points table on the basis of having a better net run rate. Ahead of the encounter between the two sides tomorrow, let's take a look at the head-to-head stats between the two franchises and the probable playing XIs for the match. The DC vs MI rivalry has seen 23 matches being played so far, with DC having won 12 of those games and MI the remaining 11. Overall MI have won the title thrice while DC are yet to get their hands around the IPL trophy. This is the second encounter between these two teams this season, with DC winning the first one by 37 runs. Colin Munro hit 40 runs from 24 balls against SRH and he will retain his place. DC are likely to stick with the same team which defeated SRH on Sunday. Probable XI: Shikhar Dhawan, Prithvi Shaw, Colin Munro, Shreyas Iyer (C), Rishabh Pant (WK), Chris Morris, Axar Patel, Keemo Paul, Kagiso Rabada, Amit Mishra, Ishant Sharma. 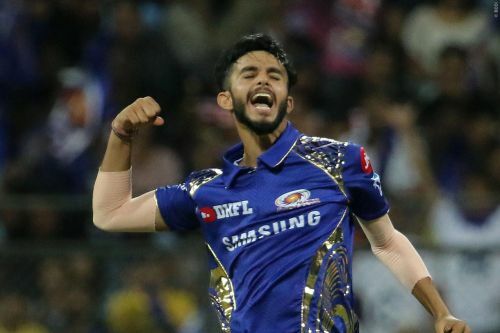 MI could replace Rahul Chahar with Mayank Markande. There are no other changes expected. Probable XI: Rohit Sharma (C), Quinton de Kock (WK), Suryakumar Yadav, Ishan Kishan, Kieron Pollard, Hardik Pandya, Krunal Pandya, Jason Behrendorff, Rahul Chahar / Mayank Markande, Lasith Malinga, Jasprit Bumrah. Mumbai Indians: Rohit Sharma(C), Quinton de Kock, Ishan Kishan, Evin Lewis, Adam Milne, Hardik Pandya, Krunal Pandya, Kieron Pollard, Rahul Chahar, Suryakumar Yadav, Jasprit Bumrah, Lasith Malinga, Ben Cutting, Mayank Markande, Aditya Tare, Mitchell McClenaghan, Jason Behrendorff, Siddhesh Lad, Anmolpreet Singh, Yuvraj Singh, Anukul Sudhakar Roy, Rasikh Salam, Barinder Sran, Pankaj Jaiswal.